It seems Clay Aiken was in New York, celebrating the holiday. He attended the Broadway show, Waitress and, not surprisingly, someone took his picture. I hope Clay enjoyed the show. 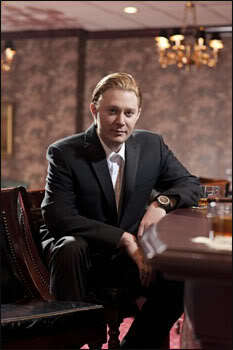 On his album, Tried & True, Clay Aiken recorded the beautiful Roy Orbison song, Crying. According to many polls and discussions, many people consider this song one of the best on the album. On October 14, 2010, Clay Aiken performed Crying with Casey Thompson as part of his WTTW – Chicago Benefit concert. The following video shows not only the great performance by the two of them, but the relaxed friendship that Casey and Clay seem to have. I had most of Roy Orbison's albums and love his unique voice with all it's glorious ranges. I listen to some of his performances on You Tube. I know he would be honored of Clay's performance of "Crying" Clay and Cassie have a great chemistry together! Thank you, CANN for sharing! Lovely!!!!! That wonderful voice just touches my soul!!!! Thank you!!! I'm crying because Clay isn't touring anymore. I sure do miss seeing him in person in concert. Hope you are all over the 'bug' from yesterday and feeling much better. Error: Error validating access token: Session has expired on Tuesday, 21-Aug-18 16:13:01 PDT. The current time is Thursday, 25-Apr-19 17:38:43 PDT.